You're walking around your yard, and you notice a little hole in the soil. Not long after, you find several of these tiny holes. If the holes are smaller than a dime, chances are they're the work of an insect. Numerous insects drill tiny holes in the ground for various reasons; it's not always simple to figure out which of these creatures is the culprit. Many of the species of Hymenoptera drill holes in the ground for various reasons. Ground bees are solitary, unlike honeybees, and prefer to drill small, 1/4-inch holes in the ground that lead to chambers for their young. These bees typically choose areas in the landscape that are free of dense vegetation; bare soil or rock-covered soil is a typical spot for these bees. Certain species of ants will create numerous tiny holes in the ground as they are excavating their expansive tunnel systems. In some cases, there will be large mounds of dirt around each hole; in others, the mounds will be smaller. For example, some leaf-cutting ants will dig many anthills while pyramid ants will dig many small mounds with rims and harvester ants will clear large areas up to 3-feet wide with a central hole. Some predators prefer to burrow into the ground, leaving entrance holes as the only signs of their underground abodes. Cicada-killer wasps, for example, are particularly large, solitary wasps that burrow tunnels into the ground to raise their young in. As their common name implies, the female wasps paralyze cicadas to feed to their underground brood. And although they're not insects, many spiders tunnel into the ground, as well, including trapdoor spiders and some wolf spiders. 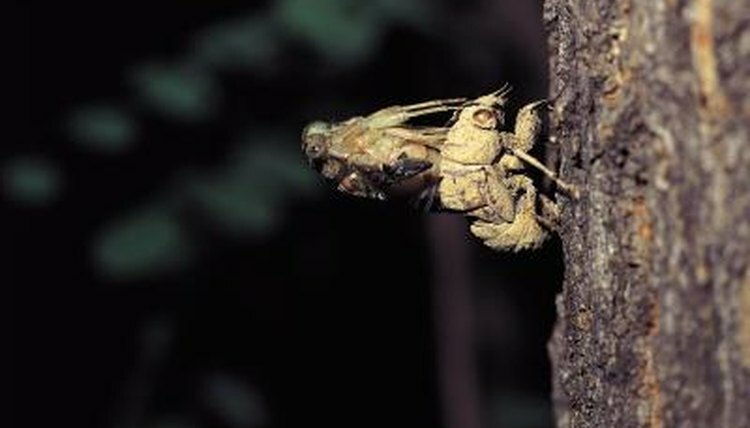 Cicadas live almost their entire lives in the ground and, at the right time, the nymphs excavate exit holes so they can live their adult lives in the open. The holes are up to 1/2-inch in diameter. The term "white grub" is applied to a large number of beetle larvae that infest lawns. They're white- or cream-colored and C-shaped. Green June beetles often create small mounds in the soil that superficially resemble anthills. However, the actual holes may or may not be present.